A “puppy mill” is a commercial enterprise that breeds large numbers of puppies for profit. There is nothing intrinsically illegal about puppy mills, and many are inspected and licensed. Often, puppy mills do not sell their stock directly, but ship to dealers and pet stores in other states. Puppy mills are only considered newsworthy if multiple puppies have died from disease or neglect. The term carries a negative connotation, and I’d like to think that most people wouldn’t knowingly patronize such an operation. But, surprising as it may seem, without a solid grasp of the particular tactics these establishments use to sell, sell, sell, you may never realize that a place is, in fact, a puppy mill. Before you inadvertently add to a puppy mill’s coffers, do some research. If you want to avoid the very real problems associated with puppy mill dogs, learn to recognize them by these warning signs. Please feel free to take the banner above by clicking here and link it to our Petition Page below! Puppies! Puppies! And more puppies! As modern consumers, we equate a large inventory and broad selection with a satisfactory shopping experience. But with puppies and other pets, just the opposite is true. Breeding healthy and welladjusted puppies is a time and energyintensive endeavor. After testing the parents for genetic problems and providing veterinary care for the puppies, breeding seldom leads to lucrative profits. An ethical breeder breeds to improve his or her “line,” and normally uses puppy sales only to offset the costs of showing the parents. The puppy mill sales strategy, on the other hand, is to make it difficult for prospective customers to go home empty-handed—so they provide a large assortment of breeds. With pets, a big selection is a danger signal! Be wary of any breeder that breeds more than two breeds of dogs or that ever has more than two litters available. In the long run, it’s better to resist this appeal to your customary shopping sense. Learn about which breed or mix is right for you before you actually go to look for your pup. An impulsive choice can lead to a boatload of regrets later! Reserving a quality homeraised puppy of a particular breed can sometimes mean a several month wait, but will pay huge dividends. 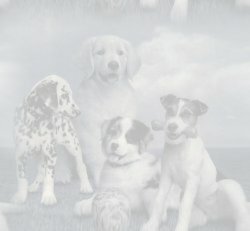 For those who want a selection but don’t want to support the puppy mill industry, consider one of the wonderful pets available at your local Humane Society. Are the puppies in a home environment with plenty of stimulation? A puppy should have plenty of early experience in its future habitat: the human home. A puppy that has been raised in a cage or barn will be undersocialized to people and to the sights and sounds of a normal household. Puppy mill puppies are so understimulated that, as adults, they may tremble upon seeing a falling leaf or hearing a cupboard door click shut. Look for a puppy who has been well-socialized to family and visitors and that lives in an active area of the house. Also, puppies should always have plenty of toys available. Do the puppies have access to a “potty area”? Housebreaking is extremely difficult for puppies purchased from puppy mills. Most spend their formative weeks in small cages with wire bottoms that allow wastes to drop through onto a tray. This teaches puppies that 1) it doesn’t matter where they eliminate because they never have to step in it, and 2) they can’t get far from the smell, so they’d better learn to live with it. The end result is a puppy that can’t be housebroken using a crate (cages are selfcleaning!) and that doesn’t have any desire to eliminate outside of its home turf (no use trying to escape from that poop smell!). On the other hand, puppies raised in a large pen in a kitchen learn the difference between living areas and elimination areas. This makes it very easy to teach indoor/outdoor discrimination later. Is the mother of the puppies present? Unscrupulous breeders may tell customers that the mother is absent because “she’s protective” of the puppies, or because the puppies are “being weaned.” These could be simply excuses. In reality, the puppies’ mom might be kept in a filthy barn or basement with dozens of other breeding dogs. Breeding stock animals are often caged together, and parents’ names on puppy registration papers may be no more than guesses. By the way, if the puppies’ mom is less than enthusiastic about your approach, the pups themselves may grow up to treat guests the same way. You don’t need the hassle of a puppy that had a “protective” (i.e., fearaggressive) mom! And as far as weaning is concerned, never consider buying a puppy so young that it is just being weaned. Is the father of the puppies also owned by the breeder? Make sure the puppy’s parents were at least two years old before being bred. This allows time for genetic or temperament problems to be discovered before they are perpetuated. Know how to read the registration papers and pedigree. If you are buying a purebred puppy, make sure that the breeder lets you review the AKC or UKC registration papers. Puppy mill puppies are often registered with official-sounding organizations that are really mailorder fakes. The Continental Kennel Club, for instance, readily supplies “papers” for any mixed or purebred puppy for a fee. 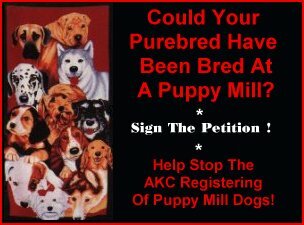 BUT...do not be mislead that the AKC doesn't register puppy mill pups...BECAUSE THEY DO! Go to the Petition Page to learn how you can help in getting the AKC to stop registering these pups in hopes of putting the puppy mills out of business!! Even AKC or UKC papers say nothing about the quality of the puppy, except that the breeder knew enough to write in the names of two registered purebreds as the parents! Similarly, a pedigree is nothing more than a listing of the family tree. Speaking of pedigrees, don’t be impressed by a few champions in your pup’s ancestry. Virtually every purebred dog is from a “championship line” if you go back two or three generations! Also check the registration papers for the puppy's state of origin. Although some respected breeders live there too, be cautious of puppies bred in Kansas, Iowa or Missouri. These states have huge puppy mill industries that ship puppies to local middlemen. Has the advertised genetic testing really been done? For example, if the parents are advertised as having "good hips", the breeder should show you the documentation from the Orthopedic Foundation for Animals (OFA) or from a veterinarian. MANY breeders advertise "OFA parents" who have did not even know a hip x-ray was required to receive an OFA rating! Are males and females different prices? Puppy mill operators use this tactic to insinuate that female pups are more valuable because you can breed them and "earn your money back." Breeding purebred animals is an intensive life pursuit, in terms of time, energy, and money. It is simply dishonest to suggest it as a source of some easy pocket change. Any ethical breeder would insist you neuter or spay your non-show quality pet...which no one would pay you big bucks to breed with, anyway. Does the facility claim to be a shelter as well? Be aware that many puppy mills claim to be "no-kill animal shelters" in an attempt to sell used-up breeding stock to kindhearted people. If you want to save a life without lining anybody's pockets, adopt from your humane societies or from a recognized purebred rescue club. The only way to shut down puppy mills for good is to stop buying there!